WDI has worked with all kinds of types of wood to create products for our clients. Through our many years of experiences and trial and error, we have learned which will provide the best and most consistent results and which may not perform at a level which will stand up to our expectations. Here is list of some of the wood types we have worked with and feel can be used consistently. We stock many of these which allow us to reduce the time it may take from when we receive an order to when we can complete that order. To help with your decision, we have included a couple variables which may be of interest to you. We have designated the grain of the wood (Fine, Medium or Course), the Hardness of the Wood (1-5 with 1 softest and 5 hardest) as well as the cost ($-$$$$$$). Oak is a very popular wood, it is very hard wearing and heavy. It is known for having lovely open wood grain markings. Oak can be purchased in two shades; white oak, which is grey/brown in color or red oak which is very similar but with a prominent reddish tint. Poplar is a less expensive wood which typically has a straight, uniform grain, a medium texture and a low natural luster. It has a light cream to yellowish brown color with occasional streaks of gray or green. Hicory ranges in color from blonde or white to red or dark brown. The heartwood and sapwood contrast in hue with hickory, so items made with this wood often feature a color range from blonde or white to a red or dark brown. Hickory also has a less consistent wood grain. Red Alder has a characteristic red and light brown coloration. The wood grain is very straight and even-textured, featuring blurred boundaries between the sapwood and heartwood. Walnut is a hardwood, known for its strength, straight grain and its’ rich chocolate brown color. As with any natural products, the color can vary. Walnut can be a very versatile wood, offering a range of shades and grains to enhance your product. It is a mid- to upper-price range wood. Maple wood is a more durable, heavier wood. As maple wood is strong and moisture resistant it is the ideal wood to withstand years of wear and tear. Maple wood is pale in colour and has natural swirls and twists in the wood grain. It can easily accepts any type of stain or paint. Mahogany is an expensive, imported hardwood and varies in color from a medium brown to a deep red brown, depending on its age. It is a very traditional, versatile and popular type of wood. Since the shoots are only a few inches in diameter, bamboo is cut and laminated into solid boards or sheets. The wood is approximately as hard or harder than red oak. 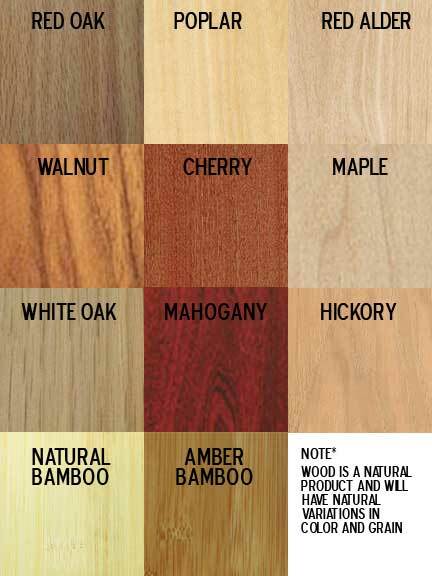 Natural bamboo that’s formed into a wood product is pale yellow in color. Bamboo manufacturers also add color to the material to make product with different shade choices from darker brown to dark red. The fastest growing “tree” on earth, bamboo is actually a grass with wood characteristics. It grows in shoots up to 90 feet tall, but just a few inches in diameter. Harvesting bamboo does not require replanting. Regeneration occurs from the existing root structure which helps prevent soil erosion. Bamboo is not natural to the US and must be imported.